ALERT: 15 of these units have been stolen, if you are offered any from a suspicious source please contact us. The Energy Logger monitors voltage and current, and determines power and power factor. Peak and average values can be recorded. Voltage is measured via the standard mains lead and current is measured using non-invasive flexible coils. It can be used for spot checks or longer term recording. The kit contains everything needed to start logging, including 3 large clip on Rogowski coils (175mm diameter), UK and EU mains leads, a USB cable and Tinytag Explorer software. 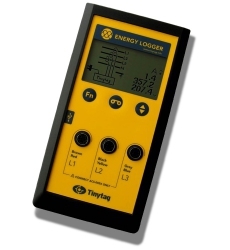 The Energy Logger uses the same Tinytag Explorer software as our other data loggers; a copy is included in the kit. Tinytag Explorer is the Windows program to configure the logger and present the data. The licence covers unlimited users on one site. 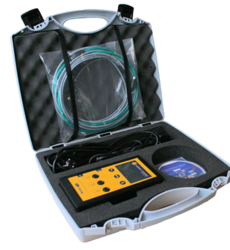 You have the option of purchasing calibration certificates with our loggers. For the Energy Logger, calibration points cover a range of currents from 10 to 1,000A per-phase in both the single and three phase modes of operation. Voltage, power and power factor readings are also tested. If you don't order calibration, we guarantee the accuracy figures on our datasheets at the point of purchase. Identify opportunities for energy savings: improve efficiency and cut costs in line with ESOS.